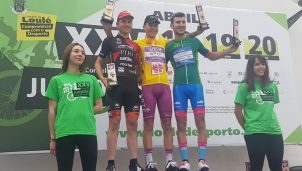 Aydar Zakarin (Lokosphinx) se ha impuesto en la tercera etapa de la Volta a Lleida élite y sub23, de 114 kilómetros entre Vielha y La Pobla de Segur, y el brasileño Nicolas Sessler (Lizarte) es el nuevo líder. 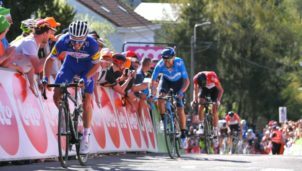 Zakarin se ha impuesto en solitario, mientras que Sessler se ha alzado con el liderato por el puestómetro frente a Iván Martínez (GSport). La carrera finaliza el domingo con la cuarta y última etapa, Lleida – La Seu Vella, 104 km. 2 85 AZMAN,Muhammad Zawaw ELITE MALAYSIAN NATIONAL TEAM 03:10:53 1:57 min. 3 52 JURADO,Christofer Ro SUB23 QUICK STEP TELCO´M GIMEX 03:10:53 1:57 min. 4 122 GARCIA,FRANCISCO ELITE GSPORT-VALENCIA ESPORT WO 03:10:53 1:57 min. 5 131 GOMIZ,ALEJANDRO SUB23 MUTUA LEVANTE – GINESTAR 03:10:53 1:57 min. 6 66 VILLAVICENC,JONATHAN ELITE ESTEVE 03:10:53 1:57 min. 7 102 JIMENEZ,MANUEL ELITE CONTROLPACK-SIX2 BADIA 03:10:53 1:57 min. 8 71 RENAULT,Baptiste SUB23 POC COTE DE LUMIERE 03:10:53 1:57 min. 9 6 ALVAREZ,CARLOS SUB23 GOMUR-LIEBANA 2017 03:10:53 1:57 min. 10 126 FONT,Bernat ELITE GSPORT-VALENCIA ESPORT WO 03:10:53 1:57 min. 11 92 ROBERT,FERRAN SUB23 TEAM COMPAK 03:10:53 1:57 min. 12 36 SESSLER,NICOLAS ELITE LIZARTE 03:10:53 1:57 min. 13 2 PRADO,SERGIO ELITE GOMUR-LIEBANA 2017 03:10:53 1:57 min. 14 11 GOIKOETXEA,PEIO ELITE AMPO 03:10:53 1:57 min. 15 125 MARTINEZ,Ivan ELITE GSPORT-VALENCIA ESPORT WO 03:10:53 1:57 min. 16 31 SOTO,ANTONIO JESU ELITE LIZARTE 03:10:53 1:57 min. 17 133 GOZALBEZ,IÑAKI ELITE MUTUA LEVANTE – GINESTAR 03:10:53 1:57 min. 18 3 MASANA,Albert ELITE GOMUR-LIEBANA 2017 03:10:53 1:57 min. 19 91 CAMPS,ALBERT SUB23 TEAM COMPAK 03:10:53 1:57 min. 20 4 FERNANDEZ,ALBERTO ELITE GOMUR-LIEBANA 2017 03:10:53 1:57 min. 21 134 ESCOBAR,AITOR ELITE MUTUA LEVANTE – GINESTAR 03:10:53 1:57 min. 22 46 LESHEM,Guy SUB23 CYCLING ACADEMY DEVO 03:10:53 1:57 min. 23 114 VALIENTE,ERIC ELITE ULB-NATURAL GREATNESS 03:10:53 1:57 min. 24 115 BONNIN,JAUME ELITE ULB-NATURAL GREATNESS 03:10:53 1:57 min. 25 23 NIKIFOROV,Arseny SUB23 LOKOSPHINX 03:10:53 1:57 min. 26 151 BRUNET,ADRIA ELITE PORTET INSTAL.LACIONS-GOU 03:10:53 1:57 min. 27 35 LOPEZ,JORDI SUB23 LIZARTE 03:10:53 1:57 min. 28 64 COLOME,Oriol ELITE ESTEVE 03:10:53 1:57 min. 29 5 SORIANO,Genis ELITE GOMUR-LIEBANA 2017 03:10:53 1:57 min. 30 103 ALCAINA,JOSE ELITE CONTROLPACK-SIX2 BADIA 03:10:53 1:57 min. 31 32 EZKIETA,MIKEL ELITE LIZARTE 03:10:53 1:57 min. 32 33 PARRA,JOSE FELIX SUB23 LIZARTE 03:10:53 1:57 min. 33 25 BOCHKOV,Kirill SUB23 LOKOSPHINX 03:10:53 1:57 min. 34 141 ROPERO,LLUIS SUB23 CORVI/TOT-NET 03:10:53 1:57 min. 35 106 PANISELLO,OSCAR ELITE CONTROLPACK-SIX2 BADIA 03:10:53 1:57 min. 36 42 NIV,Guy ELITE CYCLING ACADEMY DEVO 03:10:53 1:57 min. 37 123 TRUJILLO,ADRIAN ELITE GSPORT-VALENCIA ESPORT WO 03:10:53 1:57 min. 38 84 MISBAH,Muhsin Al Red SUB23 MALAYSIAN NATIONAL TEAM 03:11:00 2:04 min. 39 121 CAÑAVERA,JOHNATAN SUB23 GSPORT-VALENCIA ESPORT WO 03:11:10 2:14 min. 40 43 SESSLER,Guy SUB23 CYCLING ACADEMY DEVO 03:12:23 3:27 min. 41 143 BOSQUE,JOAQUIM SUB23 CORVI/TOT-NET 03:18:03 9:07 min. 42 124 ARENAS,ALVARO ELITE GSPORT-VALENCIA ESPORT WO 03:18:03 9:07 min. 43 154 SLABBERT,Wian David SUB23 PORTET INSTAL.LACIONS-GOU 03:18:03 9:07 min. 44 82 TOLHA,Muhammadizat SUB23 MALAYSIAN NATIONAL TEAM 03:18:03 9:07 min. 45 62 GUTIERREZ,JAVIER ELITE ESTEVE 03:18:03 9:07 min. 46 104 BADIA,Joaquim ELITE CONTROLPACK-SIX2 BADIA 03:18:03 9:07 min. 47 54 WOJTANEK,Bartlomiej SUB23 QUICK STEP TELCO´M GIMEX 03:18:03 9:07 min. 48 56 OROZCO,Mauricio SUB23 QUICK STEP TELCO´M GIMEX 03:18:03 9:07 min. 49 51 OJEDA,IÑIGO ELITE QUICK STEP TELCO´M GIMEX 03:18:03 9:07 min. 50 105 CARRIO,MIQUEL ELITE CONTROLPACK-SIX2 BADIA 03:18:03 9:07 min. 51 74 LE CLAIRE,Bryan SUB23 POC COTE DE LUMIERE 03:19:28 10:32 min. 52 1 PAZOS,JUAN JOSE SUB23 GOMUR-LIEBANA 2017 03:19:28 10:32 min. 53 111 CASANOVA,SERGIO ELITE ULB-NATURAL GREATNESS 03:19:28 10:32 min. 54 22 SMIRNOV,Aleksandr SUB23 LOKOSPHINX 03:19:30 10:34 min. 55 156 CAPELL,MODEST SUB23 PORTET INSTAL.LACIONS-GOU 03:22:01 13:05 min. 56 16 ZUAZUBISKAR,Illart ELITE AMPO 03:22:01 13:05 min. 57 95 LOPEZ,ISMAEL ELITE TEAM COMPAK 03:22:01 13:05 min. 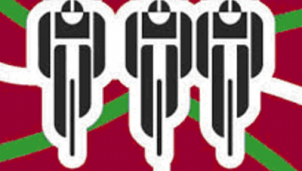 58 45 POLIAK,Yam SUB23 CYCLING ACADEMY DEVO 03:22:01 13:05 min. 59 112 CAMPILLO,ANTONIO JOS SUB23 ULB-NATURAL GREATNESS 03:22:01 13:05 min. 60 144 PIZARRO,MIGUEL ANGEL SUB23 CORVI/TOT-NET 03:22:01 13:05 min. 61 13 UMEREZ,JULEN SUB23 AMPO 03:22:01 13:05 min. 62 65 TAMAYO,DIEGO ALEJAND ELITE ESTEVE 03:22:01 13:05 min. 63 135 VALERA,Carlos Jonata ELITE MUTUA LEVANTE – GINESTAR 03:26:15 17:19 min. 64 86 SAHARIL,Muhammad Fit SUB23 MALAYSIAN NATIONAL TEAM 03:26:15 17:19 min. 65 55 CHAFER,OTTO FAUSTO SUB23 QUICK STEP TELCO´M GIMEX 03:26:15 17:19 min. 66 63 JIMENEZ,PEDRO SUB23 ESTEVE 03:26:15 17:19 min. 67 44 BEAR,Ido SUB23 CYCLING ACADEMY DEVO 03:26:15 17:19 min. 68 73 TESSIER,Florian SUB23 POC COTE DE LUMIERE 03:26:15 17:19 min. 69 72 BORDES,Cyril SUB23 POC COTE DE LUMIERE 03:26:15 17:19 min. 70 81 ABDHALL,Mohamadizzat SUB23 MALAYSIAN NATIONAL TEAM 03:26:15 17:19 min. 71 153 REIXACH,FRANCESC XAV ELITE PORTET INSTAL.LACIONS-GOU 03:26:15 17:19 min. 72 155 BOSCH,MARTI ELITE PORTET INSTAL.LACIONS-GOU 03:26:15 17:19 min. 73 12 URRESTARAZU,JOSU ELITE AMPO 03:26:15 17:19 min.